Two weeks ago I was in Vegas for ALA Annual! It was a fabulous, hot, and humid time. While there I was able to attend a committee meeting, some great presentations, and even give a few myself. Since I can't figure out if my slides are actually available through ALA or not, I decided to go ahead and post them up here. 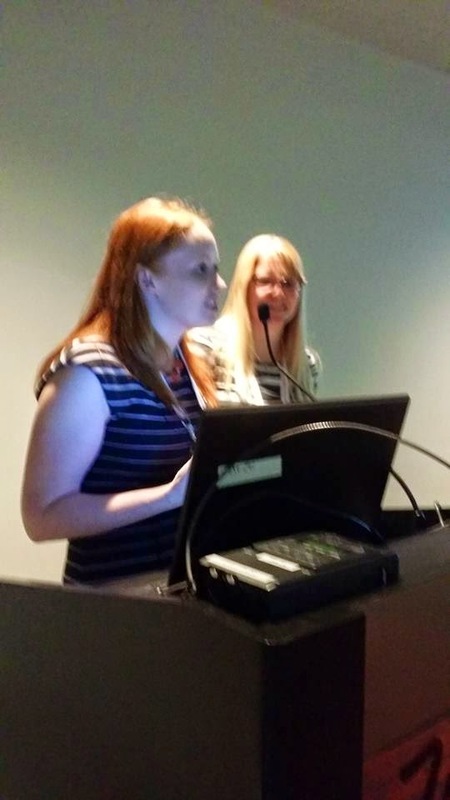 I was lucky enough to present with the fabulous Kendra of Read, Sing, Play. We are both extremely passionate about early literacy programming, storytimes, and cheap wine, so it was a perfect match for us to present together. We decided to do an IGNITE session where each slide advances every 15 seconds and we have 5 minutes total. It was seriously one of the coolest things I've ever done. It's amazing how much information you can get out in 5 minutes! It also makes you realize how much people ramble in presentations when they don't need to (guilty). the manic energy we were putting out there. I also presented with the fabulous joint chiefs of Storytime Underground about storytime. We had a great crowd and they had some amazing things to share at the end of the presentation. Four Guerrilla Storytimes happened at ALA as well. The wrap-ups can be found over at Storytime Underground. Everyone was amazing and I found like 10 new things that I want to start doing in storytime immediately. The highlight of my conference was the Newbery-Caldecott Banquet. I was very fortunate to receive the Kate McClelland and Kathy Kransnieqicz Scholarship since this was my first ALA. The scholarship was sponsored by Random House so I was invited to sit at their fancy table at the banquet. I sat next to Clare Vanderpool, Matt De La Pena, and Markus Zusak! It was probably the coolest night of my life. I couldn't even look at Markus for like 75% of the banquet. They were all very lovely to me. My biggest regret was that I didn't have enough free time to go and find Elvis. My dad is absolutely obsessed with him and I knew he would be slightly disappointed in me. As I was getting off the plane in Minneapolis, I heard a familiar voice behind me. It was ELVIS! He had followed me all the way back to Minnesota. He said he was coming to visit family and only impersonated in the winter usually, but I think it's because he knew I needed to tell my dad that I was successful in my search.